Yay! 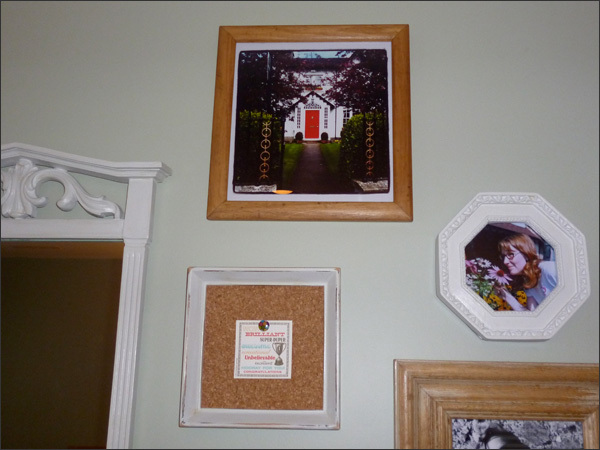 I refinished my thrift store frames in a jiffy then got a couple of my travel Instragram pics printed. I hung them on my wall of kewlness this weekend. Slowly but surely it's getting filled with mirrors, photos, etc. Here are my frames before I refinished them. I did a mini update - it only took me a couple of hours. Love it when you can update something super fast! I first took them apart. 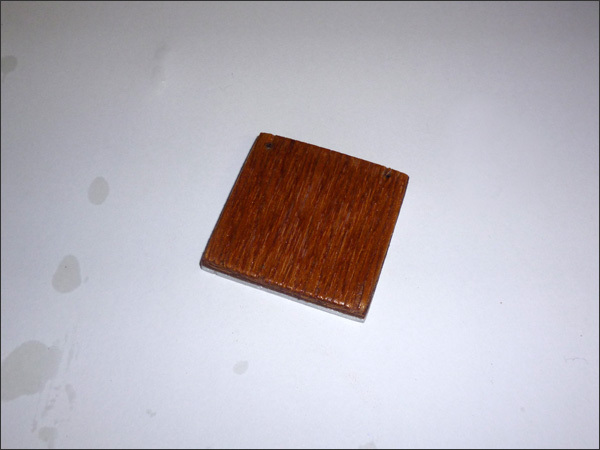 The plain wood frame I sanded, stained and then varathaned. The off-white frame just needed to be shabby chic-ed and then varathaned. Easy peasy! The off-white frame had these lovely details in the corners. 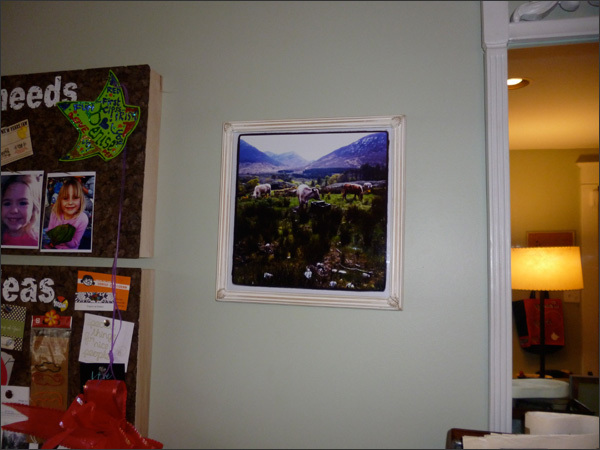 Here's the stained frame - I printed a photo of my grandparents house in Enniskerry, Count Wicklow, Ireland. This is where my Dad grew up and where I've stayed when I visit. 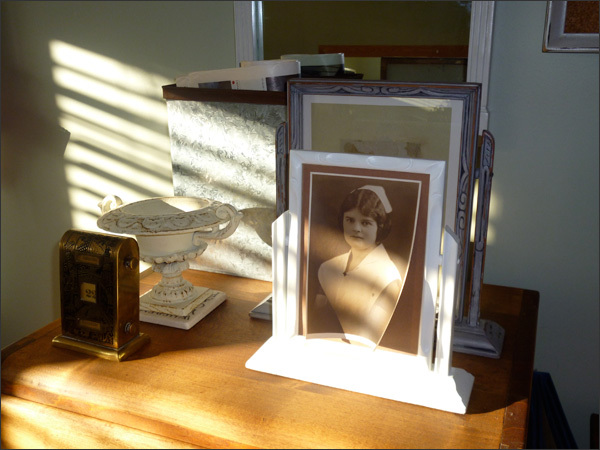 I intended this photo to go in the other frame but I really like it in the off-white frame. 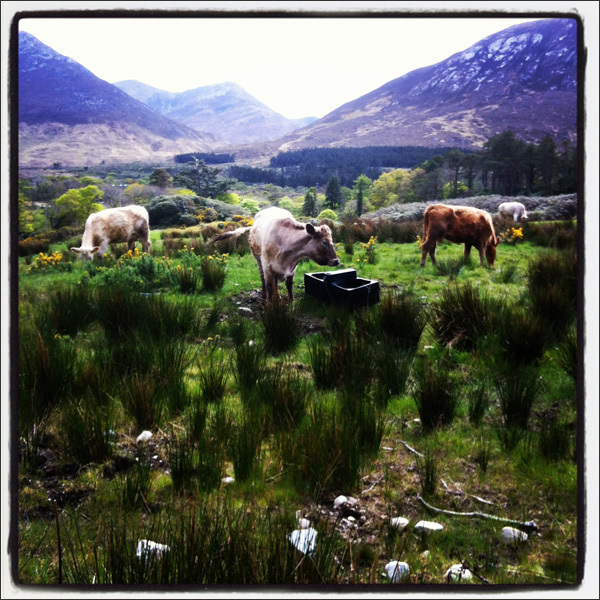 I just love this photo of cows from one of my treks to Ireland. I'm super happy with my completed frames. 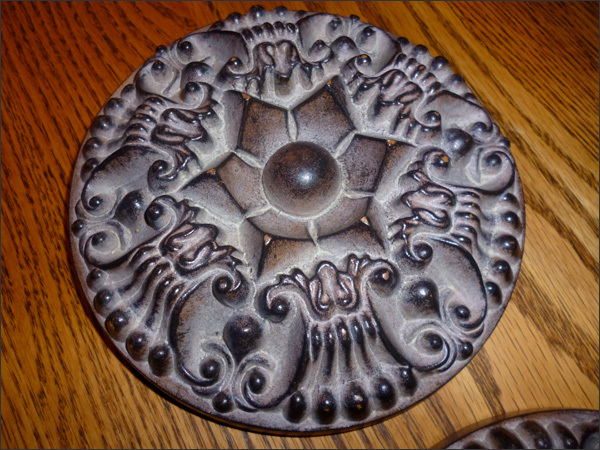 Next step is finishing up these wall decor pieces. I've started painting them so hopefully this weekend I can finish them up! I'm hoping to pick up the silver round bails for my necklace renovation this week. For now I tried something a bit different. I had some funky safety pins I had saved - I love the shape of them and thought I could use them for 'something'. Then I had this old resizable leather necklace. 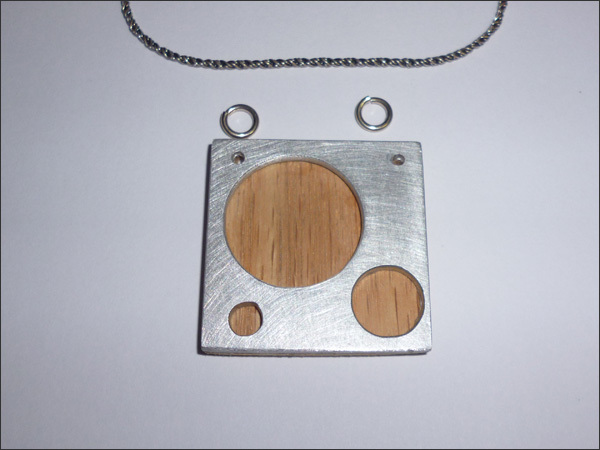 I figured it would work with the pendant if I want a super industrial look. And tada! Here's option #1 for my necklace renovation. I really like the pendant update! And it was cheap and fast! I've been asked to speak at a free public speaking series on craft, in specific about craft and the environment. Details to come! Well I'm still getting crafty these days... But having a few detours! I found this pendant last week in the Lions Gate Thrift Store - the best thrift shop for jewelry finds! It's an aluminum pendant that I paid $1 for. Love it but it seemed like it needed something. 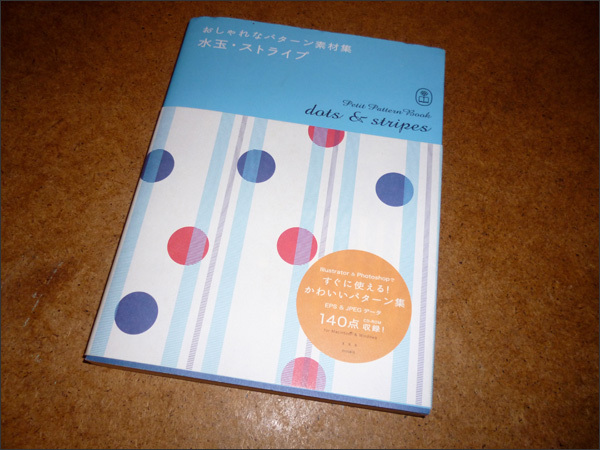 I posted a photo to my TBD Facebook page and to Twitter. And oddly enough who tweeted back but the guy who designed this piece. Small world or what! 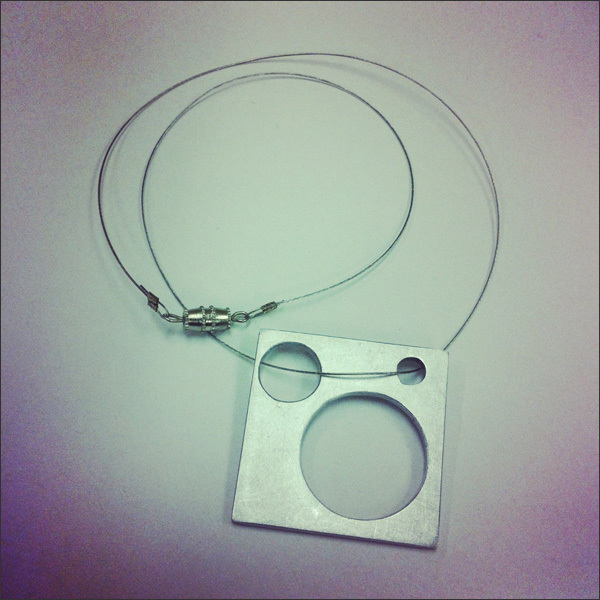 The aluminum pendants are called Rem[a]nders 1.1. They were made in 2010 by Designers at Large. 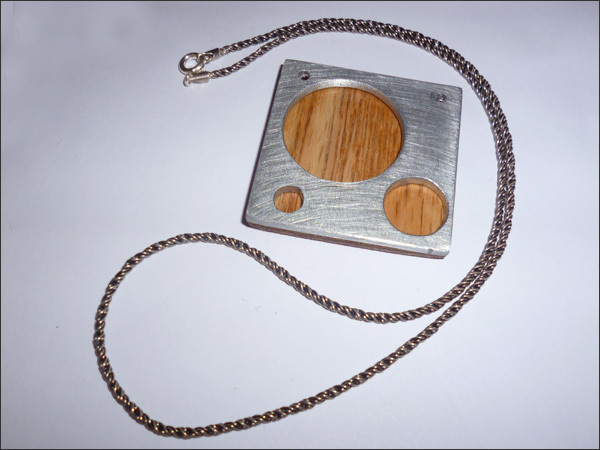 The pendants are made from scrap material from the waterjet cutting process which is used to create additional products such as jewelry pieces. We had a discussion about upcycling and technically I wasn't upcycling but 'renovating' his pendant. I'm kewl with that! Part of my update includes scrap doorskin that I'll use to give the pendant more depth. I'm also using a new to me necklace that a friend gave me for free. 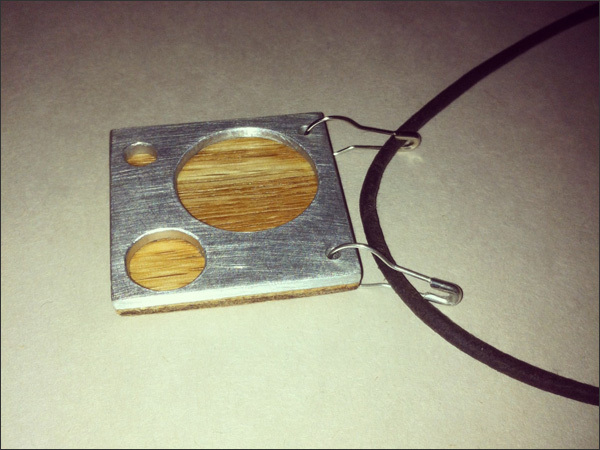 The pendant will hang from the necklace using round bails. 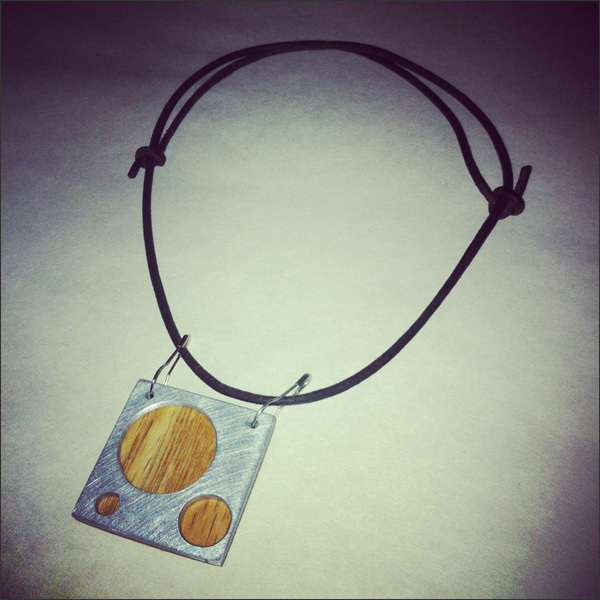 Here's the pendant along with the scrap doorskin. First step was adhering the aluminum to the doorskin. 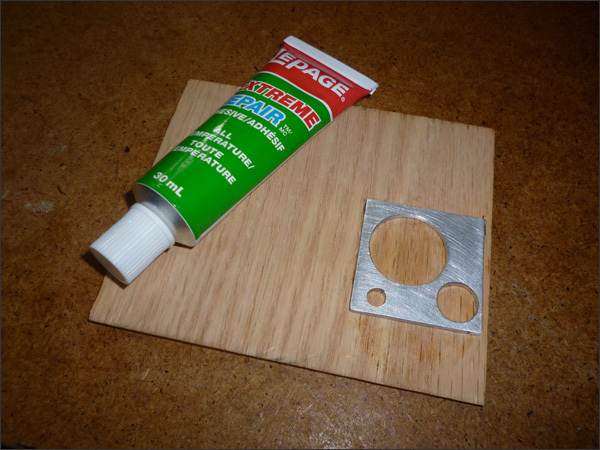 I then used a hand saw to remove the excess doorskin and then used sandpaper to sand it down. This way the wood is flush with the aluminum. After that, I got out my trusty power drill and added holes for the bails. This was the only stressful part because if I messed up then the whole update would have been ruined! After the sanding, I added some tung oil to the wood and then varathaned it. Next step is to find larger bails - the ones I had are too small. Bummer! Was so excited to get this update done in a jiffy. It was so fast and easy! 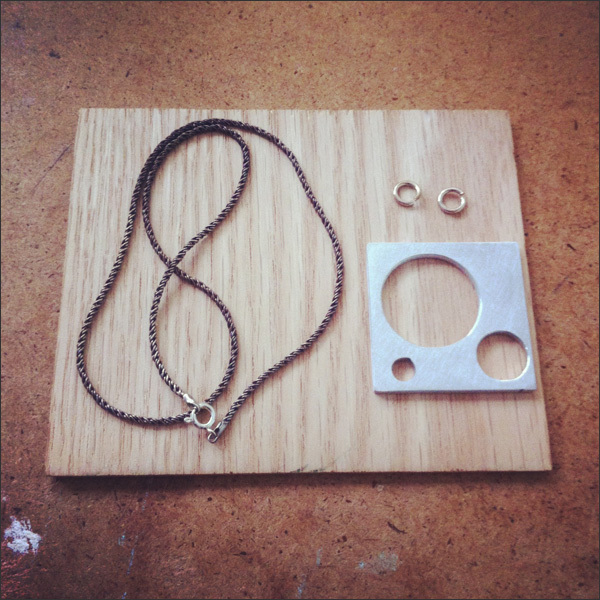 And the necklace plus pendant renovation is going to be darn FAB. Yay! Yay! It's a gorgeous, sunny day in Vancouver. 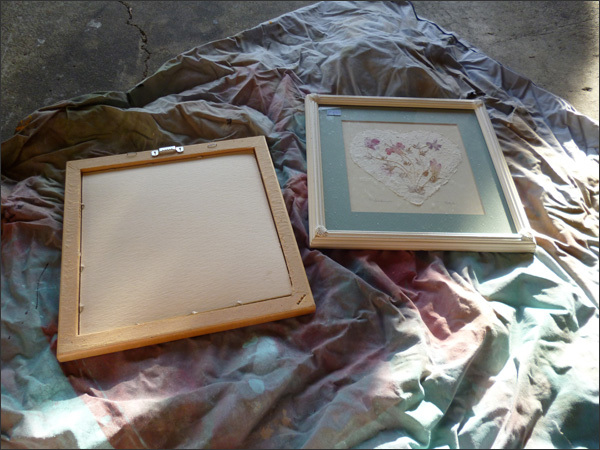 I'm going to refinish a couple of frames I picked up at the Lions Gate Thrift Store this week. They're the same size but different looks which I like. I paid $3/each. I'll remove the handmade paper - maybe donate it back to the thrift store. It's not my thing but may be someone else's. 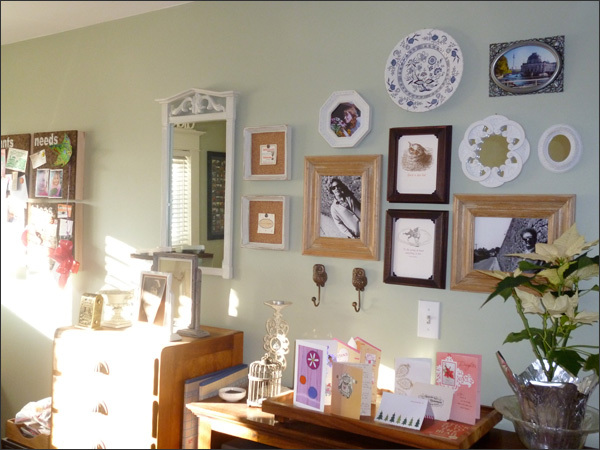 I thought I could get some travel pics printed and add them to the frames. This is my FAV pic from my trip to Ireland in the spring. This one will go into the plain wood frame. 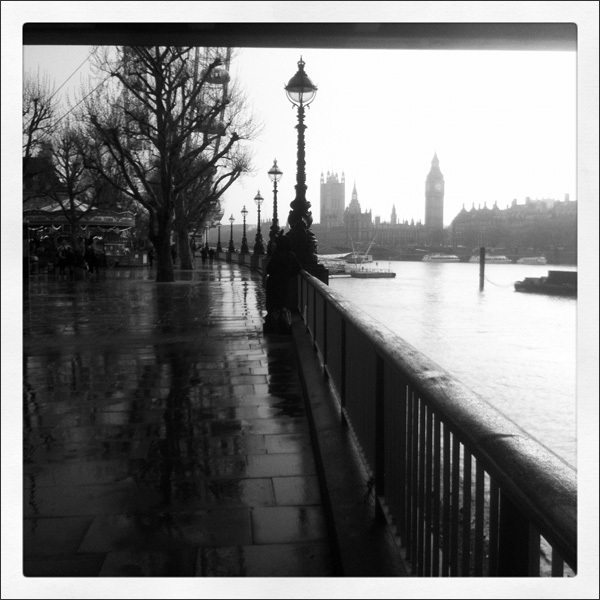 I'm also printing this black and white shot from my time in London. 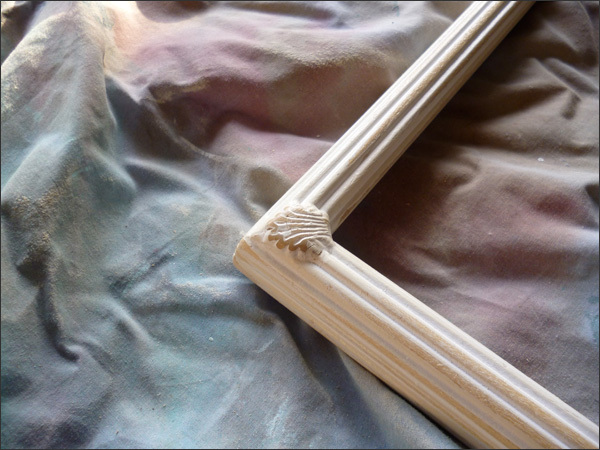 I think it'll suit the white frame once I rough up the finish on the frame. 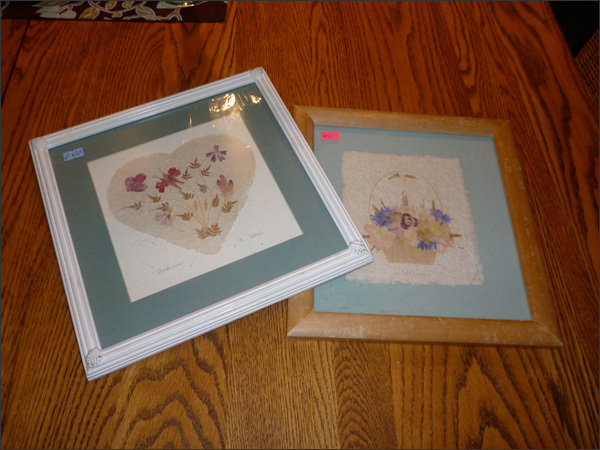 I also picked up these wall decor pieces for $2.50/each. 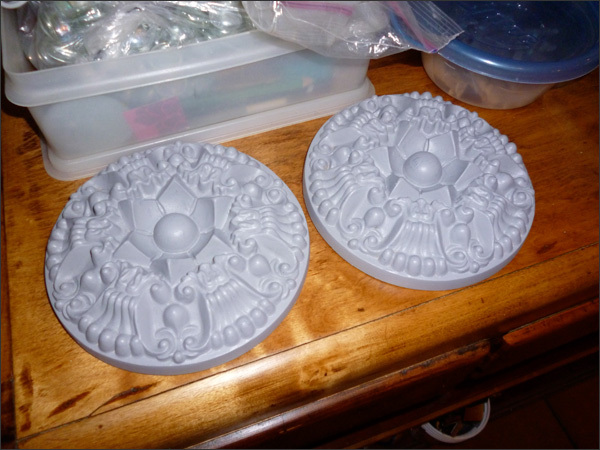 I'm going to paint them so they look like plaster. Maybe an off-white/light grey colour. And then maybe rough them up as well. All should be easy peasy updates! 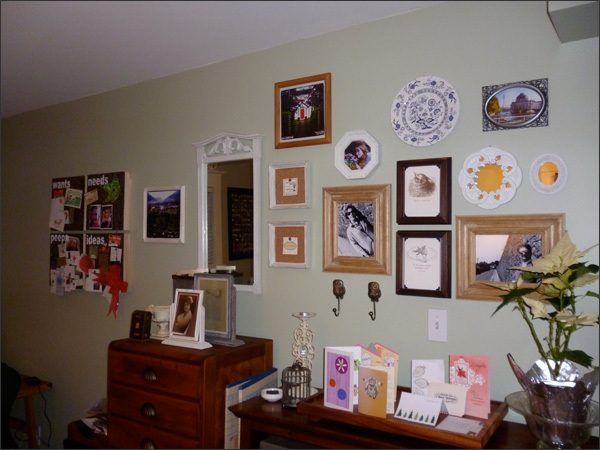 I also need to design some prints for these frames. FINALLY... Or maybe a print for one and a photo for the other. We'll see! Hope everyone has a FAB weekend! It's going to be sunny all weekend... Painting outside, hiking, trekking around town... Yay! Getting crafty & lovin' it! 2013 is starting off with some new found love for getting crafty! Maybe it's wanting to start the new year off right or maybe it's because it's grey and wet outside. Right now I'm catching up on requests for friends. I'll be making a pillow cover for a nursery soon. I still have a couple of Xmas stockings to sew but now I have a whole year to get those done! I ended up making a ton of fridge magnets this week - definitely one of my favourite projects! 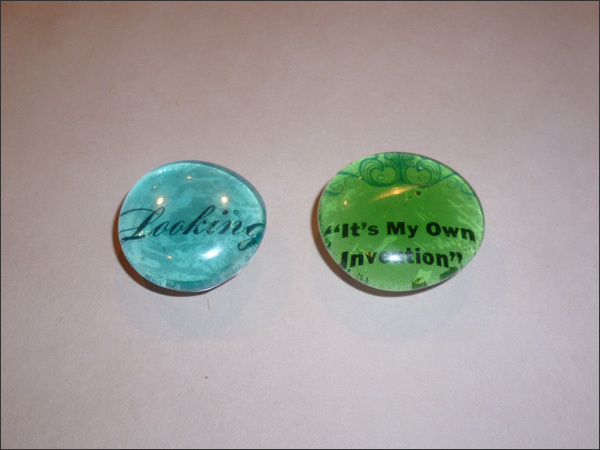 I made these for a lady who works at the Lions Gate Thrift Shop. 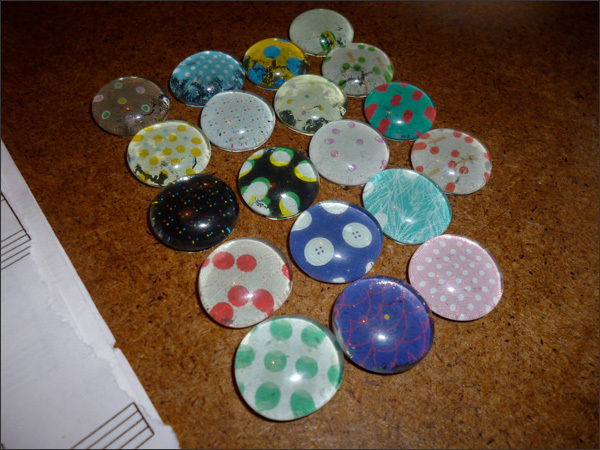 I still have tons of glass jewels from the thrift store that I can upcycle. For some of the magnets, I used a sheet of paper from this thrift store find. 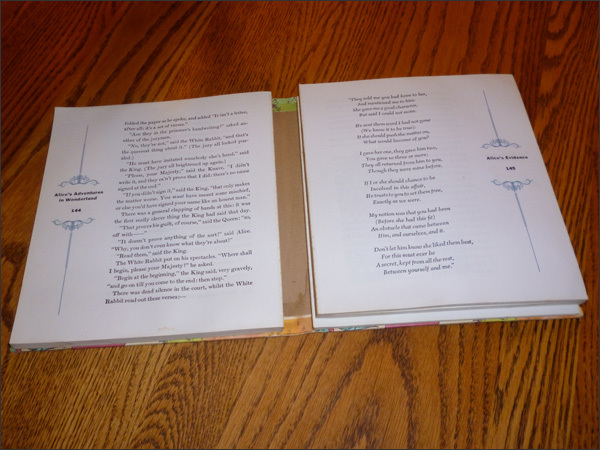 I also used old sheet music and a book from the thrift store. 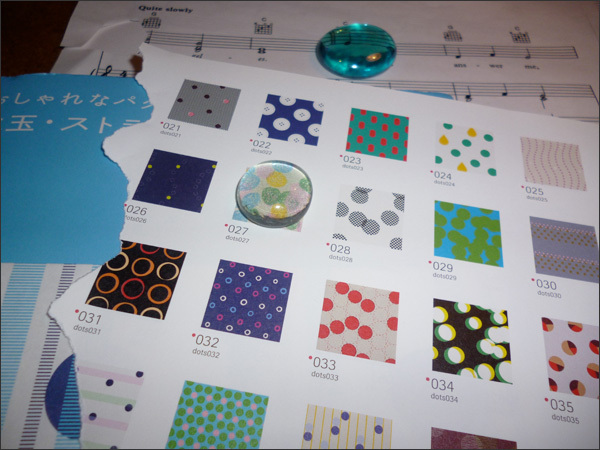 Here's the sheet of paper I used to create 20 mini fridge magnets. I did all the gluing and trimming first. Then I got my glue gun out and added the magnets. Love how easy this project is! 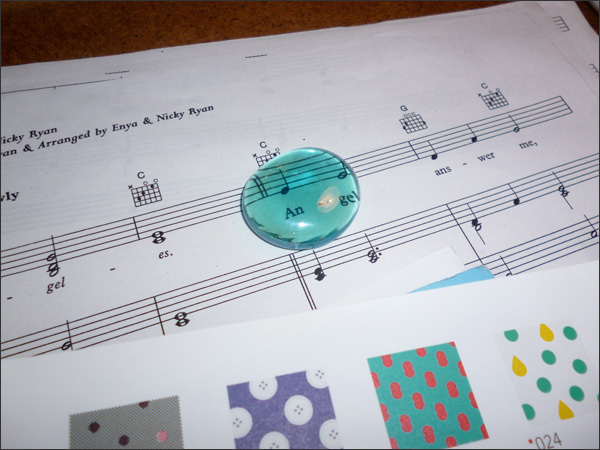 Next I made large fridge magnets using the sheet music. 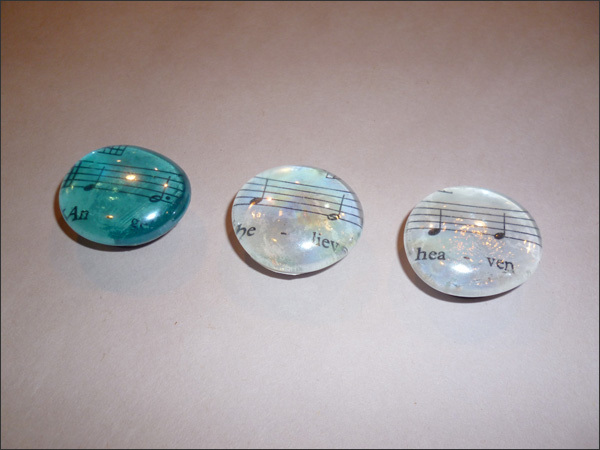 Here are the finished fridge magnets: 'angels', 'believe' and 'heaven'. 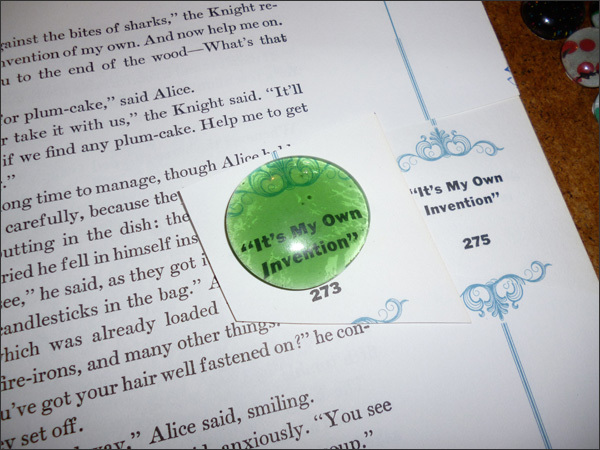 I also made fridge magnets using an old book. 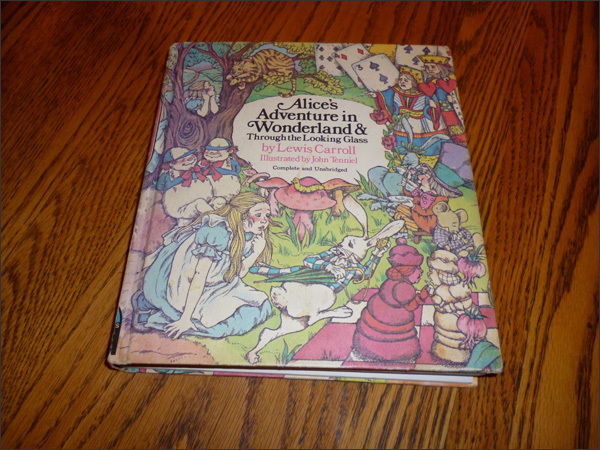 I picked this up at the thrift store for under a dollar. There are some great illustrations in the book that could come in handy! I don't believe in tearing books up for DIY/upcycling projects but this one was pretty destroyed so needed to be reloved! I picked out a couple of quotes/words that would work for my fridge magnets. 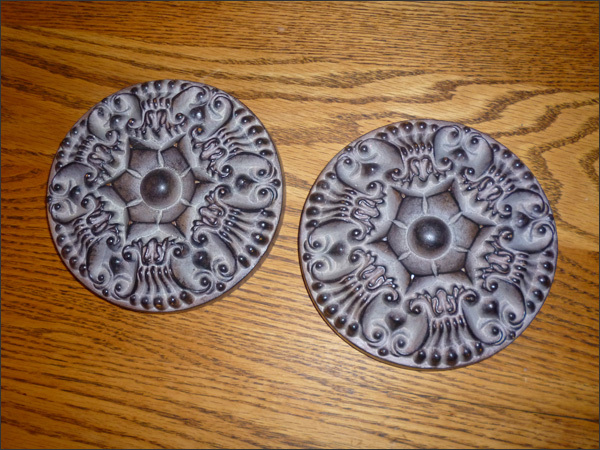 Here are the 2 large fridge magnets I created using upcycled thrift store finds. Next step is to drop them off at the thrift store for my buddy Ingrid. 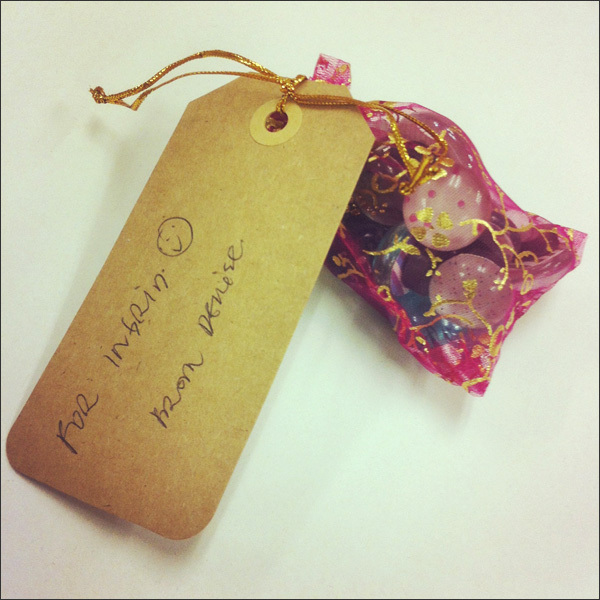 I love passing on the upcycling love! Here's to a fun start to a hopefully very crafty year! 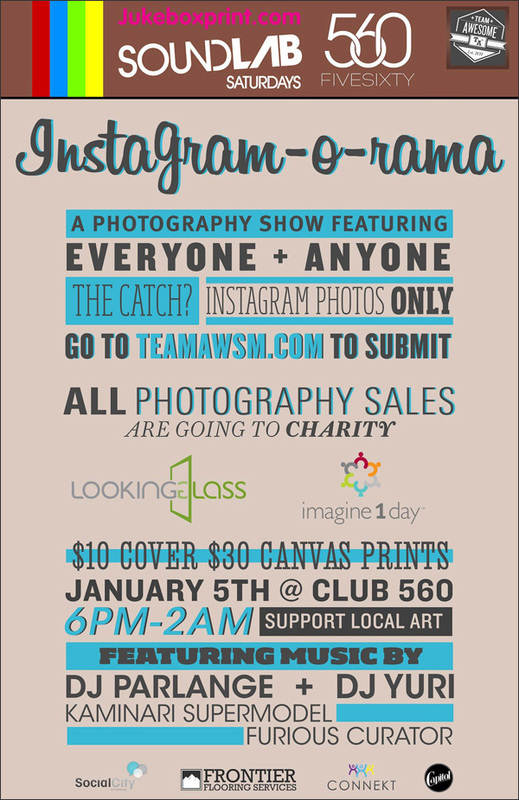 This Saturday was Team Awesome's fundraising event, Instagram-O-Rama. 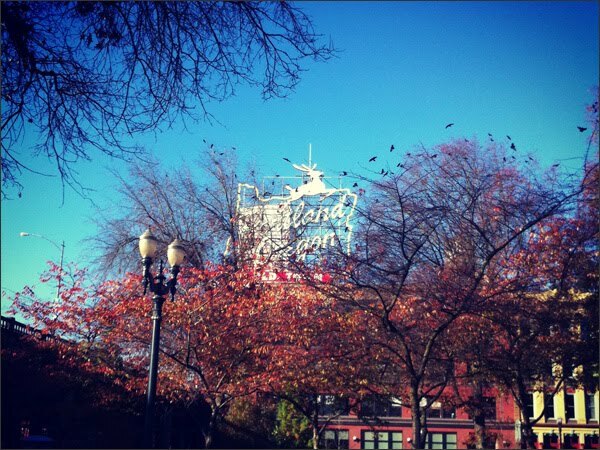 Instagram-O-Rama showcased the works of local photographers and their photography skills through Instagram. 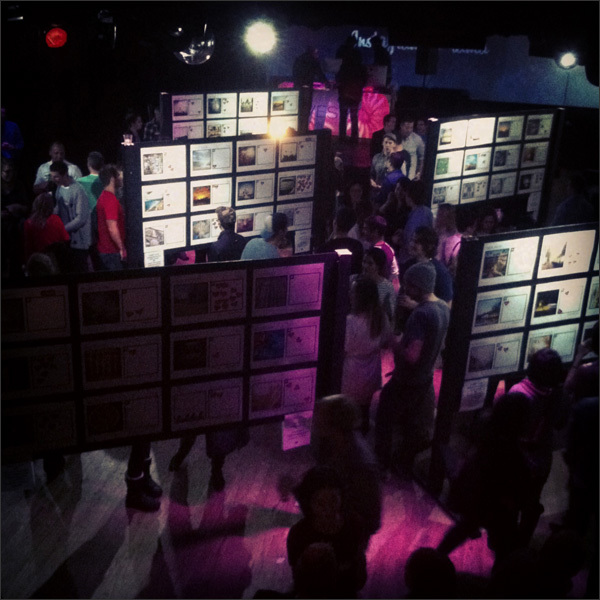 200-user submitted photos were showcased on 19" x 13" high quality prints. 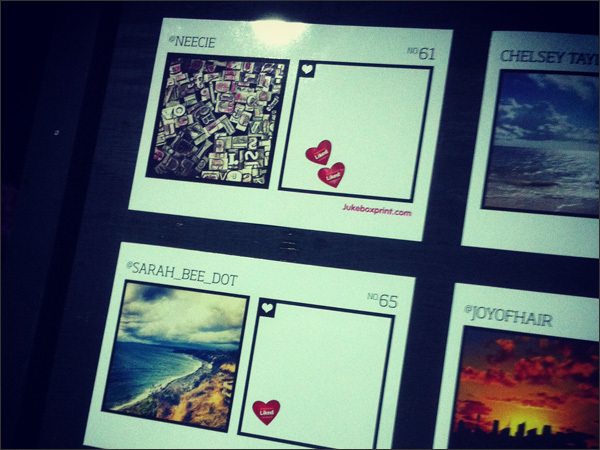 The proceeds from the prints sales went to support imagine1day and The Looking Glass Foundation. imagine1day is a Vancouver-based charity working towards a big goal of all Ethiopians having access to quality education funded free of foreign aid by 2030. In their work over the past 5 years, imagine1day has seen the impact that providing accessible education to girls in particular can have on communities and the future prosperity of a nation. The Looking Glass Foundation is a community of parents and friends who are committed to creating support and improved programming for those we love suffering with eating disorders. Girls deserve the strength of all us on their journey as they grow into the woman of tomorrow. It was a fun event! Lots of people attended with tons of kewl prints to check out. I submitted some of my Instagram pics. 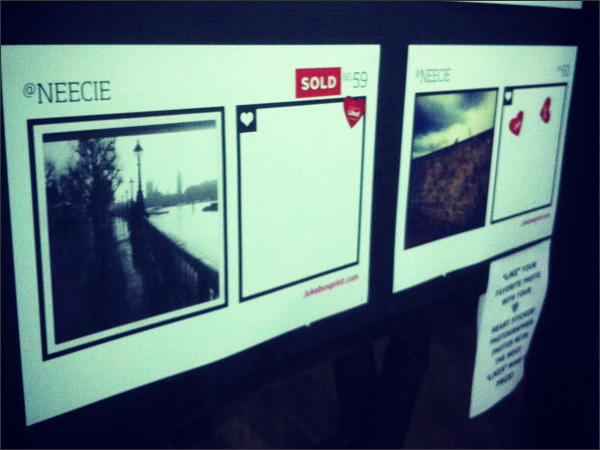 I thought only one had been chosen but in fact four of my photos were selected! 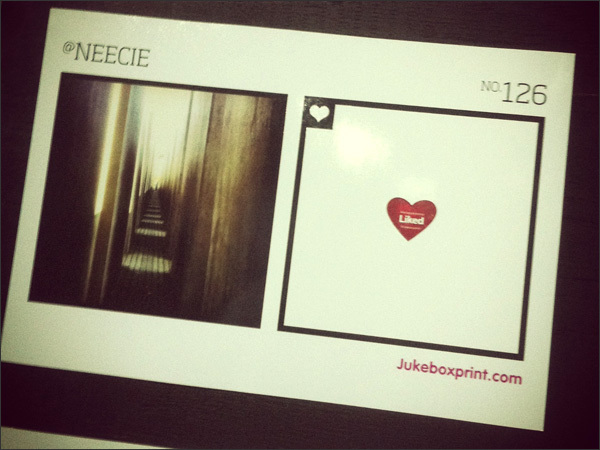 My Instagram name is @neecie - it's not public but one day soon I may change it from private to public. We'll see! 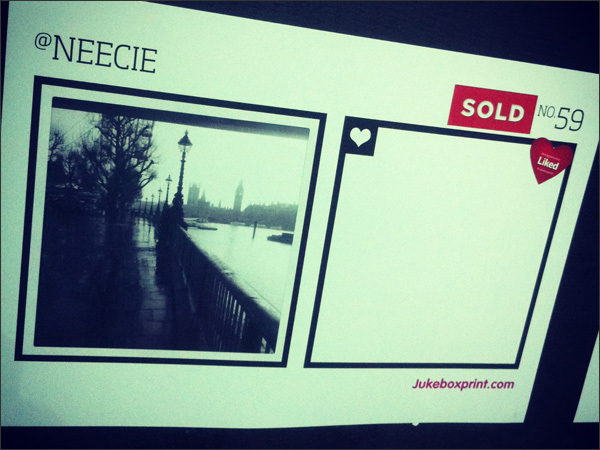 This black and white print from my trip to London sold out. There were four prints for sale per photo. All four prints were bought in a jiffy! Visit the Team Awesome website, www.teamawsm.com, for more info. Hope everyone had a great Xmas and a super fabulous New Years! 2013 is going to be amazing! 2012 wasn't too shabby though. Lots of lovely highlights from the year. 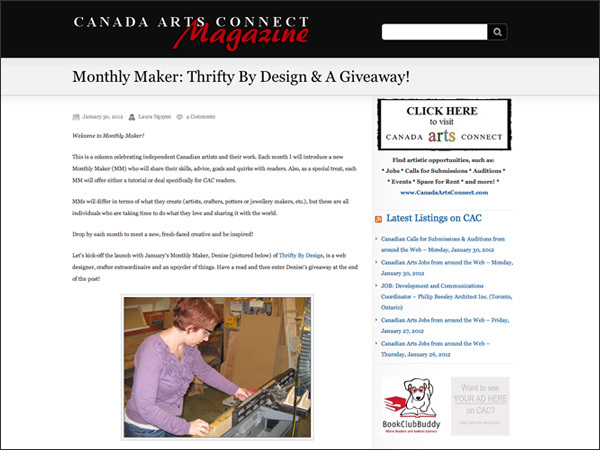 I was the first crafter to be featured in Canada Arts Connect Magazine's new column called Monthly Maker. 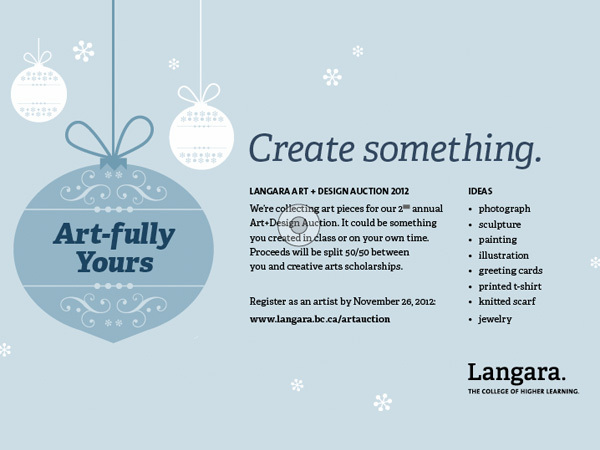 It was a complete surprise - Laura Nguyen saw an upcycled stool I had donated to the Langara College Art Auction 'Art-fully Yours' and approached me about the feature. Pretty kewl! 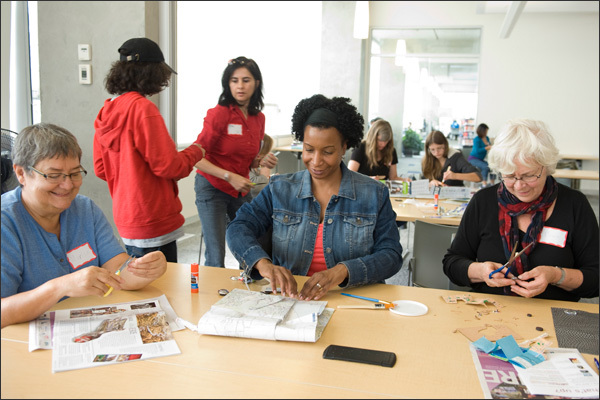 There was also a follow up feature, Monthly Maker 2012 Holiday Wrap-Up. Thanks so much to Laura Nguyen and Canada Arts Connect Magazine for the great promo! In the spring, I took off for 3 weeks to London and to Ireland. It was a FAB trip in so many ways! Very inspiring! Plus I reconnected with my aunts, uncles and cousins. The travel bug has been awoken! Already thinking about spring 2013 - where to go?! And for how long! 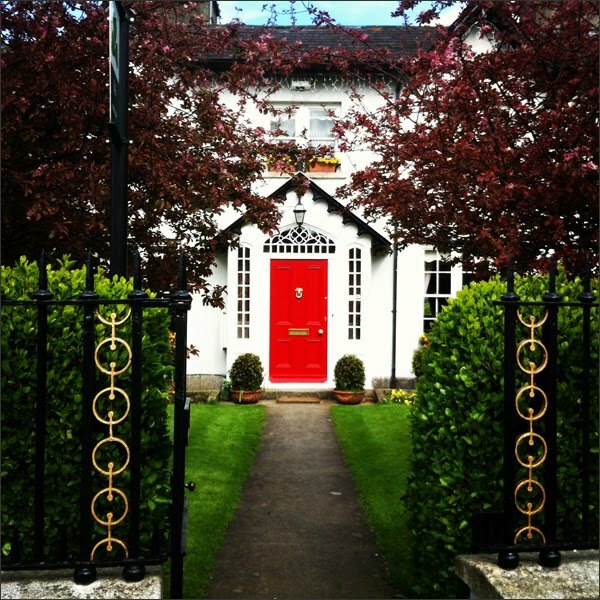 Here's where I stayed in Dublin - this is where my Dad grew up in Enniskerry, County Wicklow. 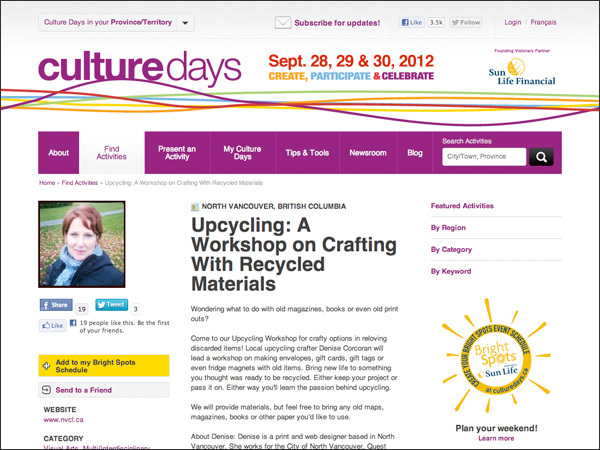 I was asked to organize an upcycling workshop for the North Vancouver City Library as part of Culture Days. This was an amazing experience! I had such a great time organizing the event and meeting so many kewl crafty peeps! 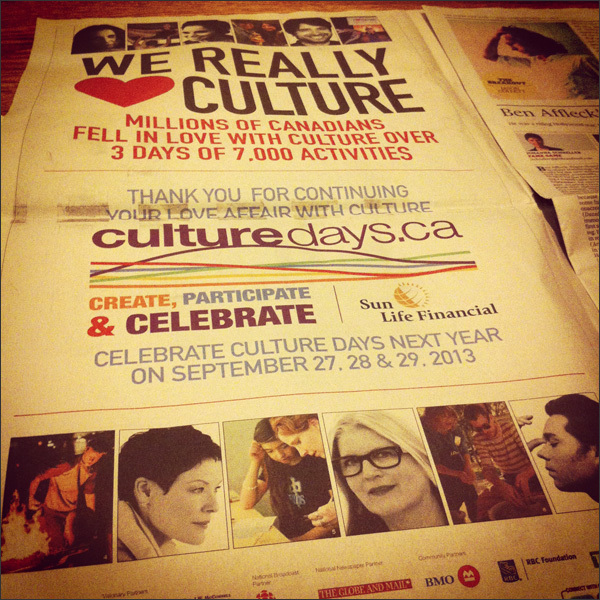 My friend Nicole Friesen took photos of the workshop - one was featured in the Culture Days thank you ad in the National Post. Pretty nifty! Next was my trek to Berlin. 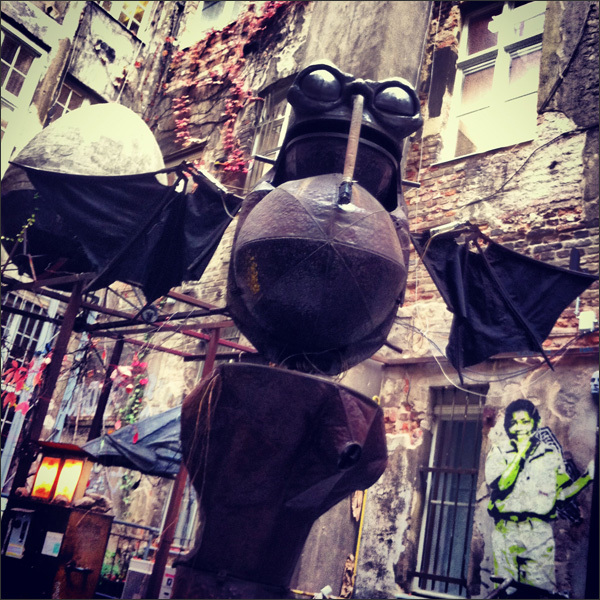 Man I loved Berlin! I was going back to Ireland for a wedding and tagged on a week in Berlin. It was a great adventure to go on my own, find my way around, meet new peeps and to explore a very kewl city. I'll be going back sometime soon! Here's a pic of a scrap metal sculpture. 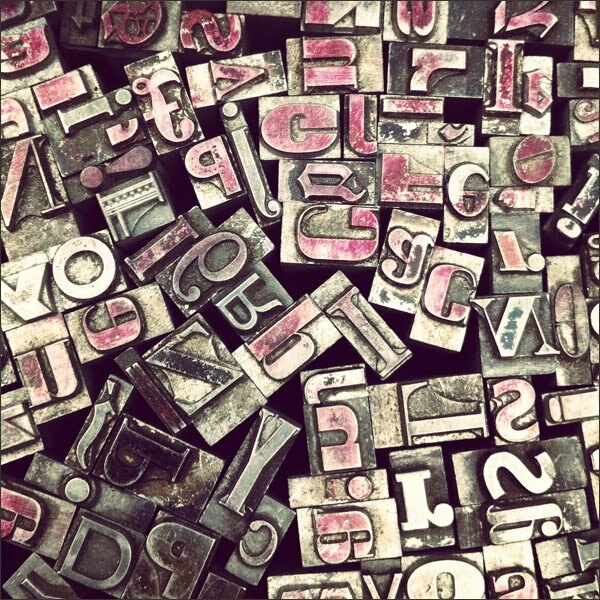 Tons of upcycling inspiration to be found! When I got back from Berlin and Ireland, I took off for a few days with friends to Portland. Yup another great trip - kewl city with tons of inspiration. 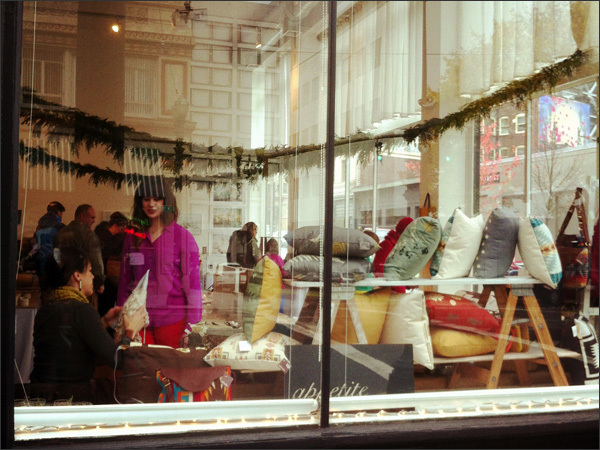 I found so much crafty goodness in Portland like this market we just happened upon. 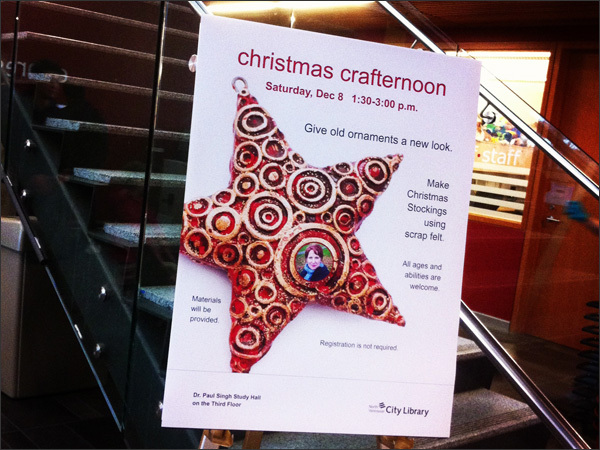 And then I organized another upcycling workshop for the North Vancouver City Library. This one was for some nifty Xmas projects. It was super fun! 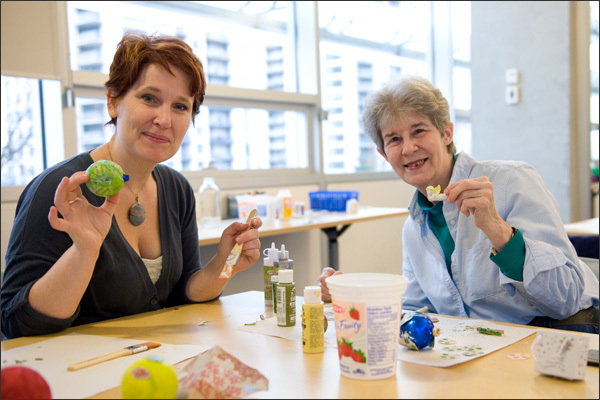 Here's Bonny and I getting crafty! Bonny was at my first workshop. 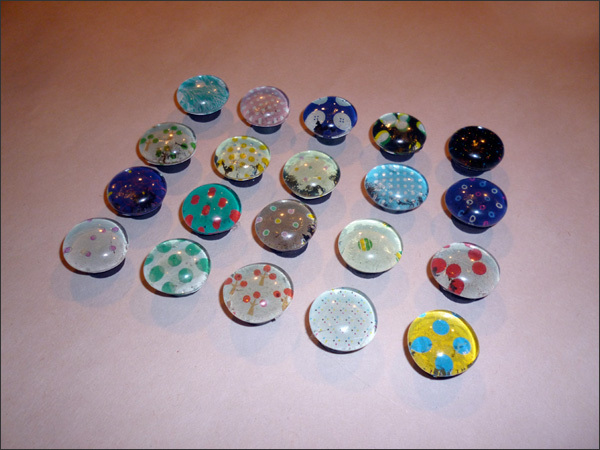 I donated more crafty, arty pieces to the 2nd Annual Art and Design Auction, 'Art-fully Yours'. And this year, I went to the auction. It was so much fun and all of my items found happy homes. Last year I donated Xmas stockings and an upcycled bench. 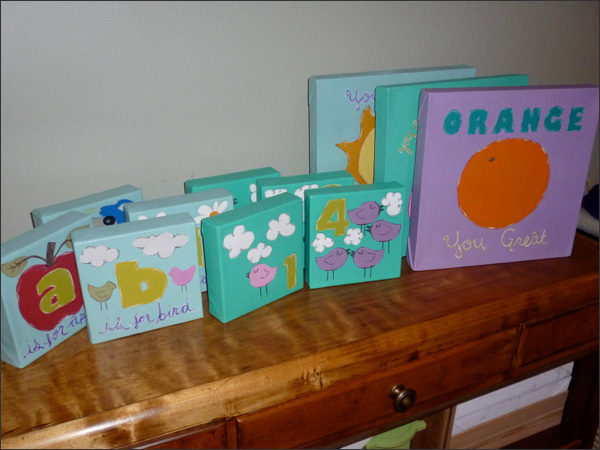 This year I donated these paintings and some upcycled Xmas ornaments.